In addition to being a blogger and fashion stylist, I also do party and event planning. 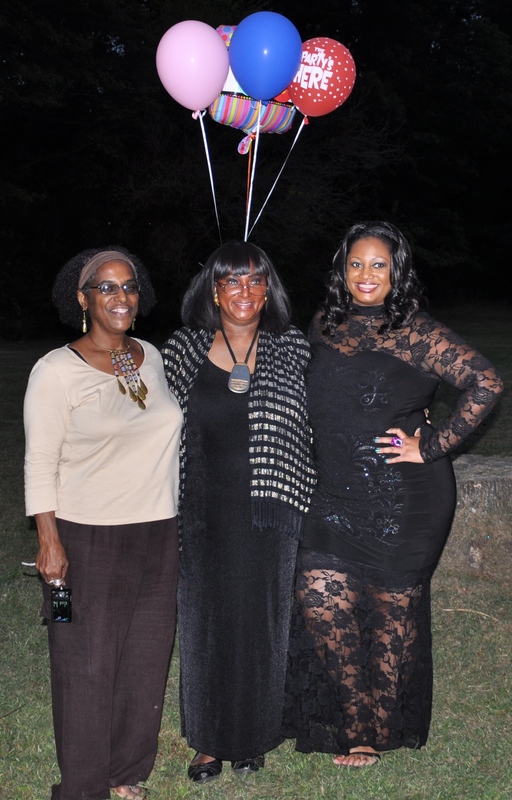 So yesterday I threw my Mom a SURPRISE 60th Birthday party. Boy was she surprised too. She was stunned for about an hour, lol. I wanted to get the family together for a joyous occasion since my Grandmother’s passing a few weeks ago, so I held it at my Grandmother’s, her Mom’s, house for sentimental reasons. It went off without a hitch. Since I was playing “Hostess With the Mostess” for the day, I wanted to look the part. Now dig this, the alibi I had to use to get my Mom dressed and to the party was that we were going to a fashion show and dinner. So I had to dress the part. On Friday I posted about this BodyCon Lace & Embellished Floor Length Gown from Chic and Curvy Boutique that favored the one Beyonce wore to the Inauguration. Well that’s what I wore to host the party. Now let me tell you, this dress is what you wear to make an entrance to an event. Just like Beyonce’s gown, this one was very figure flattering and appealing to the curves. It gave me a lil’ sumthin extra too I think, lol. (Make sure to wear a strapless bodyshaper for a smooth foundation under the dress). There is this exquisite detailing on the front of the dress that has sparkle and shimmer in the design. I had 3 of my cousins and my aunt lined up to take this dress off of my hands at the end of the night. For my jewels, very much like Beyonce I kept it minimal but colorful. I wore a large fuchsia cocktail ring and multi-colored rhinestone earrings. Hi there I have the same dress and it looks fab on yah! Hey Tami, I saw your pics last night too and they are GORGEOUS! Love the dress, tried to order one to wear to my dad’s 50th birthday but they only have 1x left. If you don’t mind my asking, what size did you order because we are about the size. I’m wearing a 3X as I do in all of my Chic and Curvy clothing to allow for washing and these hips, lol. Girl! You were giving it to me in this dress. It is wonderful on you. I love your style. You are a diva! Love, love the dress! Your mom and aunt look like they are fashionistas also. It is refreshing to see that your family is still finding ways to enjoy life although you have lost the Matriarch of the family. I’m sure your grandmother was right there in the midst of the celebration having fun as well, just from Heaven this time!! !